Police seek "person of interest" in arson at 1310 South 20th Street in Point Breeze on May 1, 2017. Philadelphia police are searching for a "person of interest" in the Point Breeze arson that appeared to have been suspiciously timed to sabotage the plans of local developer Ori Feibush. The two-alarm blaze, ignited in the pre-dawn hours of May 1, severely damaged an 11-townhome project led by Feibush's OFC Realty. Investigators with the ATF examined the residential properties, all in various stages of construction around 20th and Wharton streets, and determined the fire was incendiary. 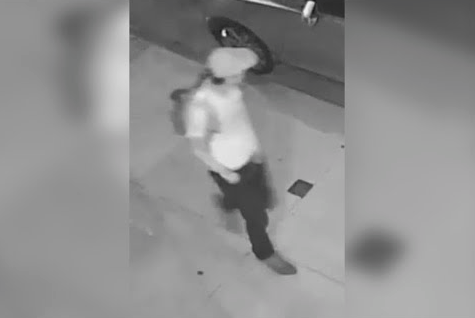 On Monday, Philadelphia police released a video of a man they believe may be connected to the fire. Initially seen wearing a hooded sweatshirt, the white male suspect returns to pass the surveillance camera a short time later wearing only a white t-shirt. Police are asking the public to note the suspect's distinctive brown shoes and reflector on his backpack. The ATF already has posted a $10,000 reward for information leading to an arrest and conviction of those responsible for the fire. Feibush, in a statement on Facebook, said he would add $10,000 to the law enforcement reward and contribute another $90,000 of his own money to find the culprit. "(Seventy-five) firefighters put their lives at risk to prevent the fire from becoming a true catastrophe," Feibush wrote. "There is absolutely no room for this type of cowardly and reckless behavior in our city." The incident in Point Breeze came less than 24 hours before a group of anti-gentrification vandals damaged luxury vehicles and newly developed properties in the Northern Liberties. Two people were arrested in connection to that incident, which police have not linked to the fire in Point Breeze, where Feibush has been a controversial figure for introducing pricier properties into the neighborhood. The ATF, the Philadelphia Fire Marshal’s Office and the Philadelphia Police Department are jointly handling the ongoing investigation. Anyone with information about this case should call the ATF's 24/7 hotline at 1-888-ATF-FIRE.